Sunday is my day to sleep in and when Waldo and Lily came to wake me up I got a surprise. 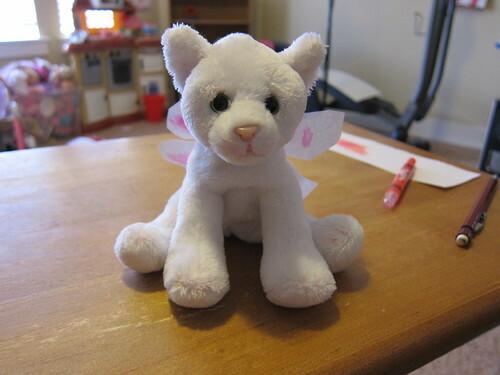 Lily showed me her new kitten Snow Flake and I saw she had some special Lily made wings taped to her back. Me: Those are beautiful wings Lil, nice work. 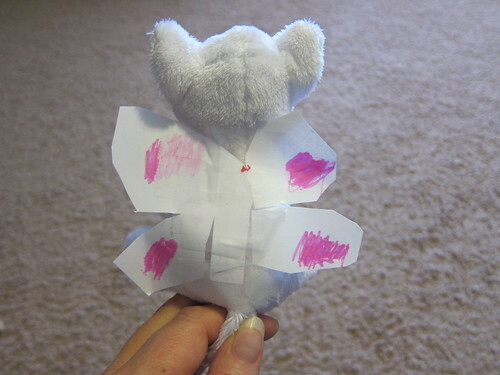 Lil: I made her wings because it’s been her dream to fly. Me: Oh yeah. That’s cool. Lil: I made her dream come true. After we got dressed I grabbed the camera and asked her why she made the wings. I just needed that for the future. This entry was posted in Arts and crafts, Life, Lily, video and tagged Arts and crafts, Lil, video.